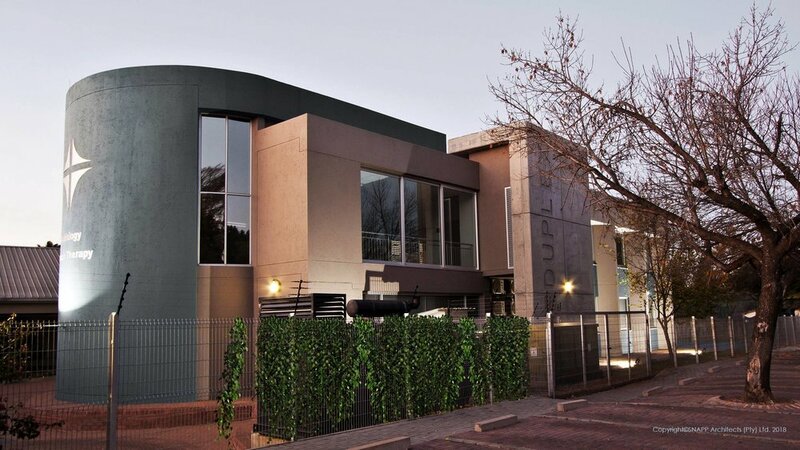 The Client required a modern extension to the existing Eduplex Pre-Primary School buildings in which to house the Parent Guidance and Audiology Centre along with various training facilities. The entrance and open waiting areas are positioned directly adjacent to the existing school. This necessitated that the new building’s roof fit in below the existing one, in order to provide a buffer in height and spatial planning, between old and new. The audiology centre houses a number of consultation rooms/offices which are specifically designed for the testing and treatment of variously aged children. Areas for play exercises and for the teaching children how to function in environments similar to those they will encounter outside of the school (e.g. domestic kitchen spaces) are provided along with observation rooms for parents so that they can participate in the testing and learning sessions or can watch the activities undertaken by audiologists from a separate room. The spaces needed to function practically as an audiology centre, with correct acoustic treatments and allowance for both back and front of house functionality, however special consideration needed to be given to the fact that the patients are all children. A large training room with lobby and refreshment area is constructed above the audiology centre. Access to the first floor training room is gained via a feature curved staircase and with a shared reception with the audiology centre on ground floor. The planning of circulation means that visitors to the training centre do not interfere with the activities in the Audiology Centre on ground floor. SNAPP has a longstanding relationship with the client which allows us to transfer institutional experience developed on previous audiology projects to the new facilities. The client is always involved along the way. The audiologists were also consulted and encouraged to compile a brief on their individual requirements, and give feedback after occupation.